Nerella Mohana Dhana Sai Krishna. Department of Biotechnology, sathyabama institute of science and technology, Chennai, Tamil Nadu, INDIA. Couroupita guianensis is commonly known as cannonball tree, belonging to the family Lecythidaceae. This tree has enormous medicinal values since most of its parts are used as medicines traditionally. In this work, two major aspects were studied. Firstly, the phytochemical screening and biological activities of various extracts of leaf, flower and fruit are prepared and studied. Secondly, silver nanoparticles were synthesized from these parts, characterized instrumentally and checked for its antibacterial activity. This study reveals that except the aqueous extracts, all other extracts have good antioxidant and antibacterial activity hence stating the presence of bioactive compounds. Flower mediated nanoparticles showed better results than others which may be due to the presence of certain phytochemical compounds responsible for the reduction and capping of silver nanoparticles. 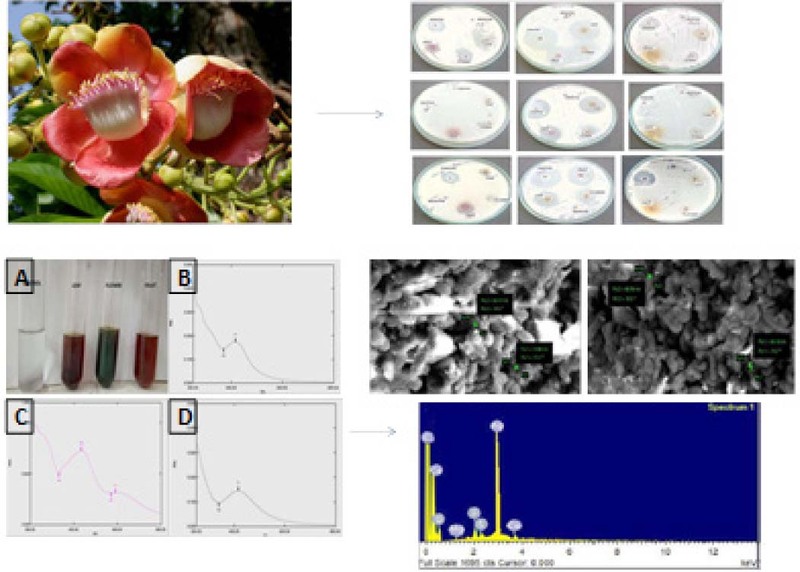 These results showed the potential of Couroupita guianensis and further investigation to isolate such pharmacologically active compounds that can be used in the production of novel drugs for various diseases would be promising. Plants are one of the most valuable sources of the natural products. Almost all the parts of the plants namely leaves, flowers, fruits, stem and root have their own bioactive compounds which can be used for therapeutic purposes. Typically medicinal plants ensure an extensive supply of antibiotic, antifungal, antiseptic, analgesic compounds etc.1 (Nelson and wheeler, 1937). Recently, traditionally used medicinal plants have attracted the attention of scientific and pharmaceutical communities because of its effectiveness in managing multi-drug resistant bacterial strains and its negligible side effects. The World Health Organization (WHO) estimates that 80% of the population of south Asian and African countries prefers herbal medication. Couroupita guianensis is one such medicinal plant which is widely used in Chinese traditional medicine. Couroupita guianensis Aubl is a large deciduous tropical tree belonging to the family Lecythidaceae (Brazil nut family). It is commonly referred as “Cannonball tree” in English (because of the cannonball like fruit structure), “Kailashpati” in Hindi 2 (Satayavati et al., 1976) and “Mallikarjuna” in Telugu, “Nagalinga pushpam” in Tamil owing to its shivalingam shape at the centre of the flower and the snake hood like pollen structure. Despite its structural speciality, various part of this tree has been reported to contain oils, ketosteroids, glycosides, isatin, indurubin, couroupitine and phenolic substances with medicinal properties. Couroupita guianensis leaves, flowers and fruits were collected freshly from Krishnan koil, Nagercoil, Kanyakumari district. The samples were ensured to be free from diseases and washed for removal of dust particles. The samples are then shade dried and powdered. The nature of the powder is identified by depending on the characteristics such as the color, odor, taste and texture which can be examined physically. Various extracts were prepared for the samples using water, ethyl acetate and chloroform (1:4 ratios) by homogenization method individually. After 24 h, the solution is filtered using Whatman no. 1 filter paper and the extracts were concentrated by evaporation. The crude extracts obtained are used for following tests and stored in sterile eppendorfs at 4°C. The color and consistency of the extracts are observed. The presence of bioactive compounds is identified individually in leaves, flowers and fruit extracts of Couroupita guianensis by using the standard procedures as described by 3,4,5,6 Tiwari et al., (2011), Yusuf et al., (2014), Wadood et al., (2013), Banu et al., (2015). To 0.5ml of filtrate, 0.5ml of Benedict’s reagent is added. The mixture is then heated on a boiling water bath for 2 min. A characteristic colored precipitate indicates the presence of sugar. To a few drops of plant sample extract, 2 drops of Mayer’s reagent are added along the sides of test tube. Appearance of white creamy precipitate indicates the presence of alkaloids. To 2 ml of aqueous filtrate, 2 drops of Ninhydrin solution is added. Appearance of purple color indicates the presence of amino acids. The extract is dissolved in 2 test tubes with 1ml of hot water and 1 ml of cold water each. If the extract dissolves in hot water and does not dissolve in cold water, it indicates the presence of Theo bromine. The extract is diluted with distilled water and made up to 20ml. The suspension is shaken for 15 min. Formation of foam indicates the presence of Saponins. To 2ml of filtered hydrolysate, 3ml of chloroform is added, shaken and the chloroform layer is separated, and 10% ammonia solution is added to it. Pink color indicates presence of glycosides. The extract is dissolved in 2ml of acetic anhydride. To this, 1 or 2 drops of concentrated sulfuric acid is added slowly along the sides of the test tube. An array of color change shows the presence of Phytosterols. Extracts were treated with few drops of lead acetate solution. Formation of yellow color precipitate indicates the presence of flavonoids. To a few drops of extract, 2ml of dilute ferric chloride solution (5%) is added. Formation of violet color indicates the presence of tannins. To a 2ml of extract, few drops of saturated solution of trichloro acetic acid are used. Formation of colored precipitate confirms the presence of terpenoids. The free radical scavenging activity of the leaves, flowers and fruit extracts of Couroupita guianensis and of standard solution (ascorbic acid) was investigated using 1, 1-diphenyl-2-picrylhydrazyl (DPPH) radical scavenging method as reported in the literature7 (Asadujjaman et al., 2013) using Ascorbic acid as standard. Briefly, 0.1 mM of ethanolic DPPH radical solution was prepared in ethanol and initial absorbance was measured at 517 nm. An aliquot (1.0 ml) of each sample (with appropriate dilution 100 µg/ml) was added to 3.0 ml of ethanolic DPPH radical solution. Decrease in colour was measured after incubation in dark for 30 min. 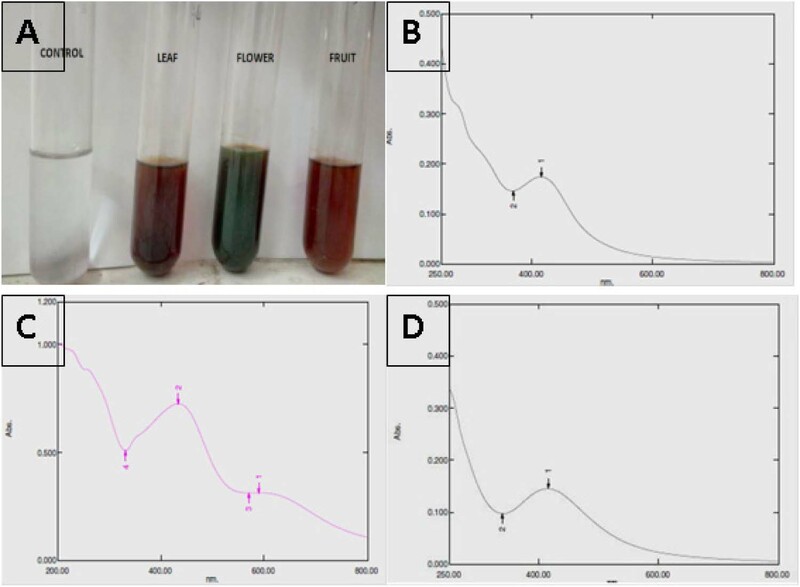 The antibacterial activity of different extracts of leaves, flowers and fruits were evaluated against 3 bacteria which includes 2 g-negative bacteria (Pseudomonas aeuroginosa and Escherichia coli) and a g-positive bacteria (Bacillus subtilis) by agar well diffusion assay as described by 8 Shah et al., (2012). 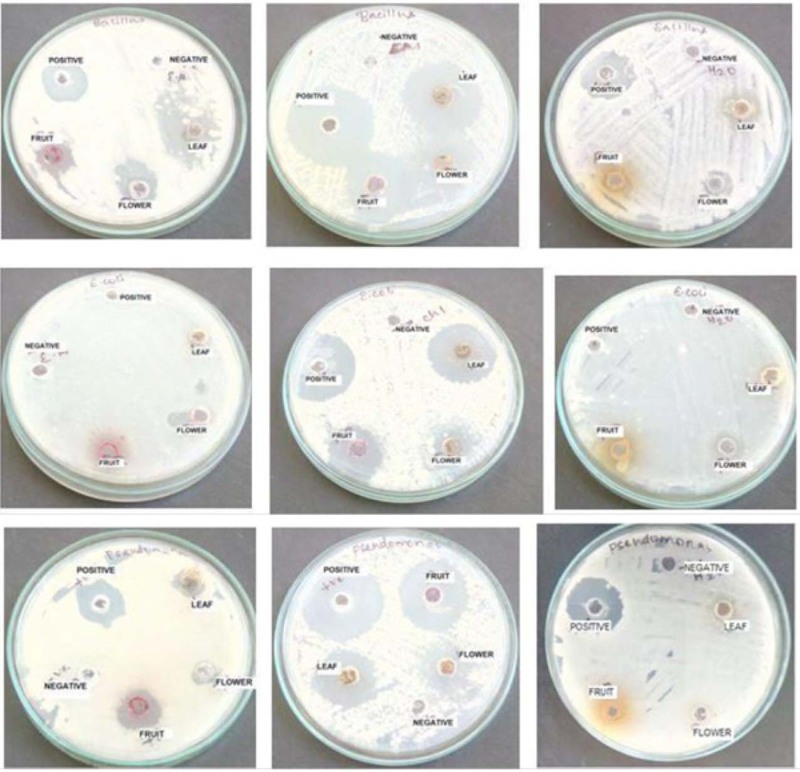 The bacterial test organisms were grown in nutrient broth for 24 h. One milliliter nutrient broth culture of each bacterial organism was used to prepare bacterial lawns on nutrient agar plates. The wells were cut and 100 μL of extract was loaded and incubated at 37°C. The plates were examined for evidence of zones of inhibition, which appear as a clear area around the wells. Thin-layer chromatography (TLC) is a chromatography technique used to separate non-volatile mixtures. Thin-layer chromatography is performed on a sheet of glass, plastic, or aluminum foil, which is coated with a thin layer of adsorbent material, usually silica gel, aluminum oxide (alumina), or cellulose. This layer of adsorbent is known as the stationary phase. After the sample has been applied on the plate, a solvent or solvent mixture (known as the mobile phase) is drawn up the plate via capillary action. Because different analytes ascend the TLC plate at different rates, separation is achieved. To quantify the results, the distance being considered is divided by the total distance travelled by the mobile phase. (The mobile phase must not be allowed to reach the end of the stationary phase). The plates are then removed, dried and seen under UV light chamber to view the separated bands clearly. Aqueous extract of leaves, flower and fruits were prepared by dissolving of 5g of respective sample powders in 50 ml of distilled water and kept in water bath at 100°C for 15mins. The filtrate obtained is then added to 1mm of AgNO3 in the ratio 1:4 individually. The obtained sample solutions are then placed in water bath at 70°C for 15mins and incubated for overnight in a dark place. The presence of dark brown color indicates the presence of silver nitrate. The solutions are then centrifuged, and the obtained pellet is lyophilized and kept for further uses 9 (Preetha devaraj et al., 2013). 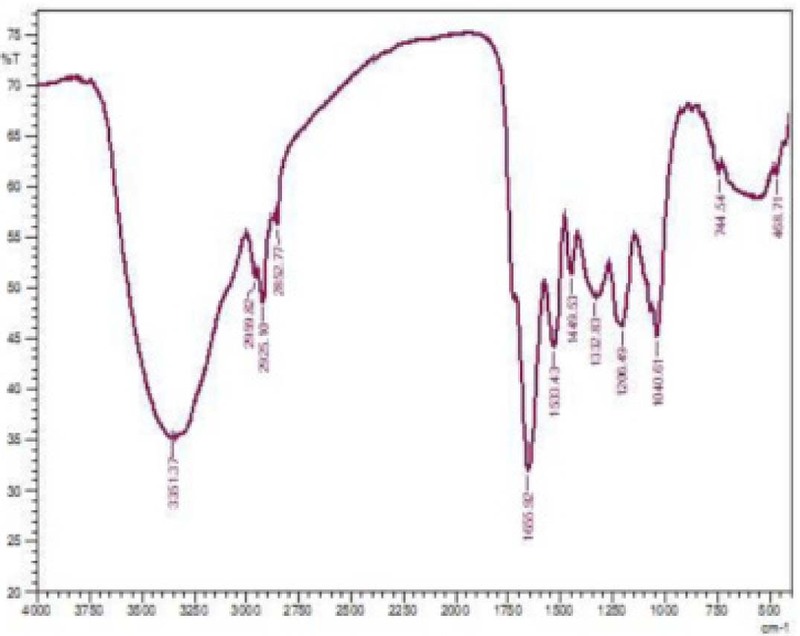 The formation of AgNPs was followed by visual observation of color change from pale white to brown and was further confirmed by the sharp peaks given by the AgNPs in the visible region from UV – Vis spectrum of the reacting solution using Perkin-Elmer Lamda-45 spectrophotometer, in a 1cm path quartz cell at a resolution of 1 nm from 250 to 800 nm. The studies on morphology, size, composition and the distribution of nanoparticles were performed by Transmission Electron Microscopic (TEM) analysis using a TEM, JEM- 1200EX, JEOL Ltd., Japan, Scanning Electron Microscope (SEM) using Hitachi S-4500 SEM and energy dispersive spectroscopy (EDAX) as an attachment on SEM. The probable biomolecules involved in the synthesis and stabilization of nanoparticles was recorded by FTIR spectrum using FTIR Nicolet Avatar 660 (Nicolet, USA). The quest for new therapeutic agents is a continuous process and the role of natural compounds especially plant based products has gained immense attention as they remain a source of a wide range of chemical compounds that can be used for various medical purposes. In this scenario, the present investigation was carried out to explore the potential of the medicinal plant Couroupita guianensis. The study was started by initially identifying the physical characteristics of the extracts in the powder form followed by analysis of the extracts obtained using different solvents. The present investigation has described the characteristics of the plant powder and the extracts and is given in Table 1. It is found that the fruit has the foul odor as reported in 10 Lester et al., (1998). It may due to the presence of sulphur compounds in the fruit11 (Gousia et al., 2013). Extraction procedure plays a crucial role in the analysis of bioactive compounds both qualitatively and quantitatively12 (Sasidharan et al., 2011). Various solvents were used in the present work for various parts of the plant namely leaves, flowers and fruits of Couroupita guianensis. It reveals that the ethyl acetate and chloroform extract of fruit have shown reddish violet and brownish purple color respectively. This may be due to the presence of indurubin (reddish pink pigment) in the fruit 13 (Tayade et al., 2014). A comparison of phytochemicals of different plant parts in different solvents was carried out and the results were provided in Table 2. Most of the phytochemicals were found to be observed in ethyl acetate and ethanol extracts than the water extracts in all the three plant parts. Carbohydrates, alkaloids, proteins, glycosides, Phytosterols, Flavonoids, tannins, Theobromine and terpenoids were found to be present in all the extracts except for saponins which is supported by the studies of 14 Reethika et al., (2015). Proteins and terpenoids were found to be absent in all water extracts. Flavonoids are the most important plant pigments for coloration 15 (Yamamoto et al., 2010) and it is found to be highly present in fruit extracts which lead us to the conclusion that this may be responsible for the color of the extracts. The obtained results show that the distribution of bioactive compounds not only varies from plant to plant but also varies within the parts of a plant. Phytochemical compounds present in the plants may not be necessarily required for normal functioning of the plant, but have a beneficiary effect on health or play an active role in amelioration of disease. Antioxidants acts as a defense mechanism that protects against oxidative damage and include compounds to remove or repair damaged molecules16 (Shekar et al., 2014). Oxidative stress is a factor for many human diseases as either a cause or an effect. Plants are the source of medication for preventive, curative, protective or promotive purposes7 (Asadujjaman et al., 2013). Imbalance leads to damage of important biomolecules and organs with potential impact on the whole organism. Antioxidants can delay, inhibit or prevent the oxidation of oxidizable materials by scavenging free radicals and diminishing oxidative stress (Philip, 2004). Natural antioxidants have been studied extensively for decades to find compounds protecting against many diseases related to oxidative stress and free radical-induced damage. To date, many plants have been claimed to pose beneficial health effects such as antioxidant properties17 (Manimegalai et al., 2014). So the present investigation was started with an aim to evaluate the free radical scavenging activity of various extracts of Couroupita guianensis. The efficiency of the antioxidants in the extracts was determined by the IC50 values, denoting the concentration of the sample required to scavenge 50% of the DPPH free radicals and the results are provided in Table 3. The results clearly indicate that though the leaf, flower and fruit extracts showed scavenging activity, the effect was less than the standard. 50 % inhibition was obtained by the standard at 200 (µg/ml) but the same effect was brought about by higher concentration of flower and leaf extracts. Of the three extracts flower extracts showed comparatively higher activity than the others suggesting the presence of more amounts of antioxidant compounds in flower. The activity of ethyl acetate and chloroform extracts was more than the water extracts from all plant parts which supports our initial screening where the water extract showed the presence of minimal phytochemicals thereby showing negligible antioxidant activity. On the other hand, fruit chloroform extract showed more inhibition (67.85%) than others and is on par with the standard there by making it the most effective part of the plant in terms of antioxidant activity. The presence of polyphenols in the fruit which are responsible for antioxidant activity would have made it more effective than the others as reported by 18 Ghosal et al., (2014) earlier. 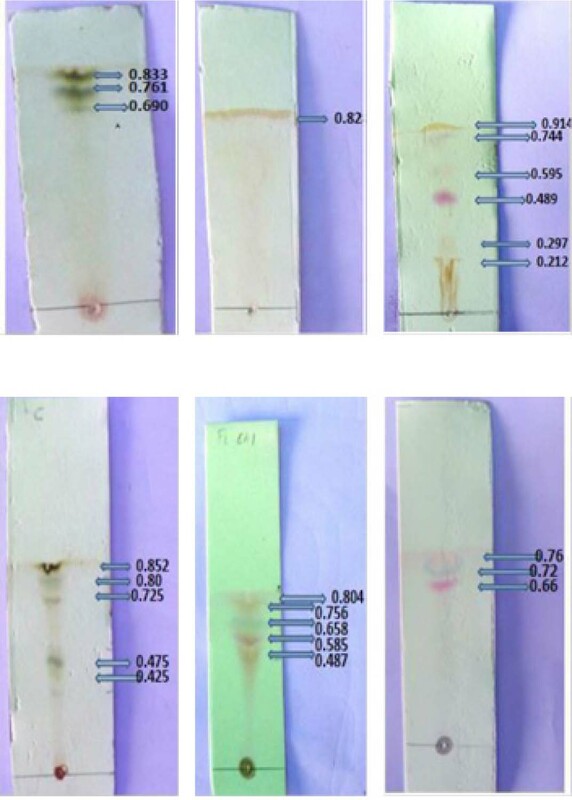 The antibacterial potential of the extracts was assessed against different bacteria by agar well diffusion method in comparison with standard antibiotic Streptomycin. The test organisms used were two gram negative bacteria (Pseudomonas aeuroginosa, Escherichia coli) and one gram positive bacteria (Bacillus subtilis). The results obtained were given in the Table 4. The present investigation reveals that all the extracts except water extracts have shown significant antibacterial activity. From the results (Figure 1), it was observed that zone of inhibition (mm) against Pseudomonas aeuroginosa is found maximum in fruit chloroform extract (14mm) which is more than the positive control (10mm), leaf chloroform extract is found more effective (10mm) against Escherichia coli) but less than its positive control (11mm) and both leaf ETAC (13mm) and chloroform (13mm) extract has shown the maximum potential against Bacillus subtilis more than its positive control (6mm and 10mm respectively). TLC analysis of ethyl acetate and chloroform extracts of leaves, flowers and fruits of Couroupita guianensis revealed the presence of active compounds that were visualized in UV. Different solvent systems were tried for each extract to obtain the clear bands (Trial and error method). The solvent systems used are tried in different combinations based on the polarity of the compound as reported in 19 Mohammed et al., 2010. The solvent system used, their ratio, number of bands obtained, and their RF value is given in the following Table 5. The standard solvent system tried was ethyl acetate (polar): hexane (non-polar) in the ratio 1:1 for which only the leaf ethyl acetate gives the positive result. The ratio is altered by increasing the hexane solvent for which the flower ethyl acetate gave the positive result, but only one band is formed. The other solvents used are methanol and chloroform which are polar and non-polar solvents respectively. Physical characteristics of leaf, flower and fruit powder and extracts. Phytochemical analysis of the extracts. Antioxidant activity of Couroupita guianensis. Antibacterial activity of various extracts of Couroupita guianensis. Antibacterial activity of synthesized silver nanoparticles. Antibacterial activity of plant extracts. TLC analysis of the extracts A) Ethyal acetate Extract: a) Leaf b) Flower c)Fruit B) Chloroform Extracts: a) Leaf b) Flower c)Fruit. RF obtained denotes the polarity of the separated bands, larger the RF values lower the polarity of the compounds and vice versa. That is the RF value obtained is inversely proportional to the polarity of the compound. From the results obtained, it may be interpreted that these extracts have many different bioactive compounds which can be further analyzed by GC-MS in future work. The picture representation was shown in the Figure 2. The ability of the extracts of Couroupita guianensis to reduce metals to nano sizes was checked by aqueous extracts of leaves, flowers and fruits of Couroupita guianensis using 1mM of AgNO3. The formation of silver nanoparticles was initially observed by the change in colour from pale white to brown. This change was very clearly noticed with the flower extract unlike the leaf and fruit extract that didn’t show notable colour change. The characteristic brown color arises due to excitation of surface plasmon vibrations in the silver metal nanoparticles.20,21 (Minaeian 2008; Sadowski 2008). This bioreduction of Silver nitrate ions was followed by UV-vis spectroscopy (Figure 3). The leaf, flower and fruit synthesized nanoparticles showed absorbance peak at 416nm, 434nm and 416nm respectively indicating the presence of spherical or roughly spherical AgNPs that remained the same throughout the reaction period, suggesting that the particles are dispersed in the aqueous solution with no evidence for aggregation 22 (Saifuddin 2009). The antibacterial potential of FSNPs was evaluated by agar well diffusion method using Streptomycin as standard. The test organisms used were two g negative bacteria (Pseudomonas aeuroginosa, Escherichia coli) and one g positive bacteria (Bacillus subtilis). The results are given in the Table 6 and Figure 4. Color Change of Silver nanoparticles; UV-Vis spectrum of Silver nanoparticles B) Leaf C) Flower C) Fruit. Antibacterial activity of silver nanoparticles. SEM micrograph and EDX analysis of flower synthesized Silver nanoparticles. From the results obtained, the FSNPs show maximum zone of inhibition against all the test organisms than the standard. It may be because of the phytochemical constituents present in the flower that helps in the reduction of silver nanoparticles and these nanoparticles may diffuse through the medium more effectively than the others. Since flower synthesized nanoparticles (FSNPs) showed more efficient results, these FSNPs were characterized using instrumental analyses. The formation of silver nanoparticles was confirmed by color change and UV-Vis spectrum. The morphology and size of the nanoparticles and their elemental composition was determined by SEM-EDAX analysis. SEM is routinely used to generate high-resolution images of shapes of objects and to show spatial variations in chemical compositions. In the present work, SEM technique was employed to visualize the size and shape of silver nanoparticles (Figure 5). The shape of the nanoparticles was spherical with the size in the range of 15-57nm and were found to be clustered. Similar shape of silver nanoparticles is reported by 23 Karthika et al., (2015). The silver nanoparticles formed are not mono disperse in nature. The larger silver particles may be due to the aggregation of the smaller ones 24 (Devaraj et al., 2013). The difference in size may be due to the availability of different quantity and nature of capping agents present in the flower extract. This is also supported by the shifts and difference in areas of the peaks obtained in the FTIR analysis. EDX analysis is used to give the qualitative as well as quantitative status of elements in the sample. Figure shows elemental profile of synthesized nanoparticles using cannonball flower extracts. The EDX spectrum reveals strong signal in the silver region and confirms the presence of silver. Metallic silver nano crystals generally show typical optical absorption peak approximately at 3 KeV due to Surface Plasmon resonance 25 (Kaviya et al., 2011). 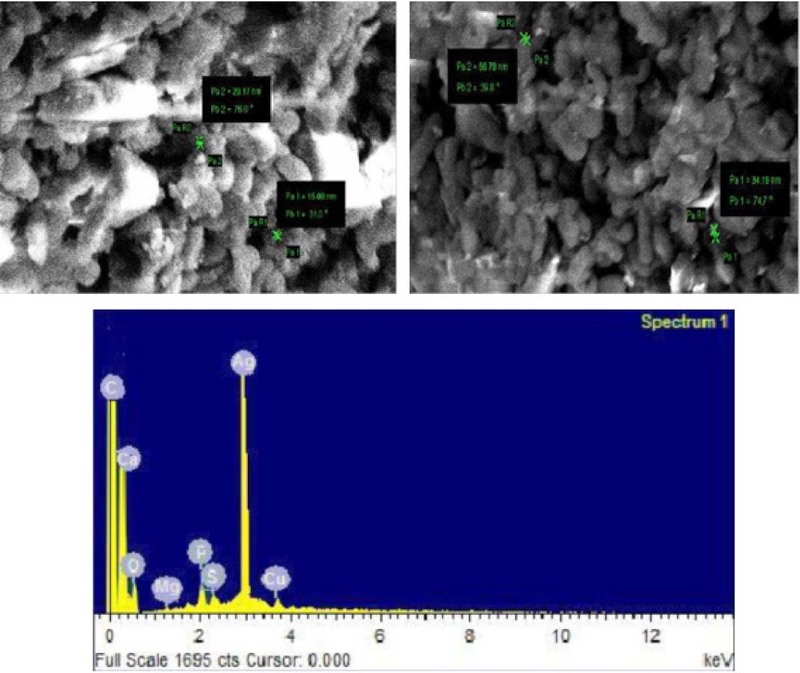 The elemental analysis of the silver nanoparticles shown in the Figure revealed highest proportion of silver followed by C, and Ca. Other peak corresponding to Cu in the EDX is an artifact of the Cu-grid on which the sample was coated 26 (Jyothi et al., 2016). There were no other peaks and this confirms the complete reduction of silver compounds to silver nanoparticles as shown in the spectrum. FTIR spectra of silver nanoparticles. FTIR spectral analysis of the silver nanoparticles was carried out to identify the nature of compounds present in the sample. FTIR spectra provides information about the local molecular environment of the organic molecules on the surface of nanoparticles. In the present work, FTIR spectral measurements were carried out to identify the potential biomolecules in cannonball flower extract that may be responsible for reducing and capping the bio reduced silver nanoparticles 27 (Udapudi et al., 2012). The observed intense bands were compared with standard values to identify the functional groups. The FTIR spectra of pure flower extract (FE) and flower synthesized nanoparticles (FSNPs) sample were compared and it showed considerable variation in the peaks of spectra (Figure 6). Seventeen peaks were found in the flower sample where as in the purified silver nanoparticles only 12 peaks were found. The reduction of certain peaks is the clear indication of the loss of certain groups. The band at 3398.63 and 3351.37 cm−1 in the FE and FSNPs spectra corresponds to O–H stretching vibration indicating the presence of alcohol and phenol. A peak at 1726.32 (ester group) is found only in the spectrum of FE and not found in the FSNPs (Figure 8). The wave number from 1200-800cm−1 has 5 stretches in FE which is responsible for N–H stretch vibration present in the amide linkages of the proteins. These functional groups have role in stability/capping of silver nanoparticles as reported in many studies 28,29 (Niraimathi et al., 2013 and Prakash et al., 2013) but only one stretch is found in nanoparticles. Hence from the results obtained it may be concluded that these changes in the functional groups may be responsible for the formation of bio reduced silver nanoparticles. The aim of the present investigation is to compare the various extracts of leaves, flower and fruits of Couroupita guianensis which showed variation in the physical characteristics. The presence of phytochemicals was noticed predominantly in ethyl acetate and chloroform extracts compared to the water extract. When checked for bioactivities, the ethyl acetate and chloroform extracts only showed effective antioxidant and antibacterial activity compared to water extracts indicating the presence of phytochemicals in these compounds which was further confirmed by TLC analysis that showed many bands in flower and fruit extracts. These extracts were also tested for their ability to synthesize silver nanoparticles. Flower extracts showed the formation of silver nanoparticles better than the other parts and also these showed good antimicrobial activity against the test organisms. These nanoparticles were found to be spherical with size in the range of 15-57nm. This study therefore proves the variation in the different parts of the plant in terms of phytochemicals as well as bioactivities and hence suggests the efficient use of these plant parts appropriately for medical and industrial uses. This study tries to compare the antibacterial potential of various extracts of different parts of Couroupita guianensis. Additionally, this study demonstrates the ability of this plant in synthesizing silver nanoparticles in which it was noticed that flower extract was successful in synthesizing silver nanoparticles (size 15 -57nm) efficiently compared to that of leaf and fruit extracts which also showed significant antibacterial activity. Therefore this study advocates the potential of this plant in producing various bioactive compounds. The authors would like to thank Sathyabama University for the support in carrying out the research. The authors have been working in the field of Humic acid research, microbial biotechnology, environmental biotechnology and nanotechnology for the past 5 years and have published papers in Web of science and scopus indexed journals. Conflicts of interest CONFLICT OF INTEREST The authors declare that there is no conflict of interest. Satyavati GV, Raina MK, Sharma M , authors. Medicinal Plants of India. Indian Council of Medical Research. Cambridge printing works; New Delhi: 1976. 4.